The EVERTOP Medicine Case provides you with a simple way to take your important items anywhere you go. With a combination lock, everything will stay securely inside until you need it. - Reliable, sturdy and durable a first aid medications and family pills, drug, vitamins organizer case. - Secure container to store your medications with a combination lock that is easy to use and changeable. - Locking up your medications keeps your medical history and the medications you take very private. - It secures strong Prescription Medication, especially if kids, teens, or others may have access to your meds. - Dividers inside box help to organize and sort pills or medication. - Easily stored in cupboards, or bring it for your outdoor travel and business trip. - Secure and easy to carry on road trips, school, work, vacations, hospital visits, or to the Doctor's office. - The initial password is four "0", please well remember the resetting password after resetting it. - Please make sure the 4 number on a straight line so that it can set successfully. - Please see the instruction before you set the password. - Please contact us if you have problem on setting the code. Security Design: Still worrying about kids getting access to meds? Caring about where to store presidential election party supplies, moreover the 2016 poll results/presidential election results? Our locking storage box is a good choice, everything will stay private and secure inside. 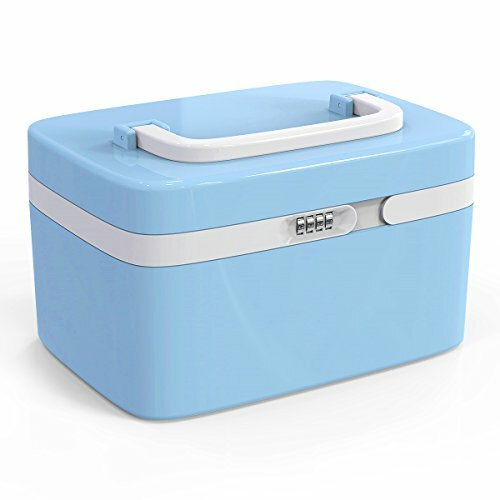 Versatile Storage: Great for general storage of medication, valuables, cosmetics tools, personal items and more, making it an ideal gift for BIG DAY/EVENTS like Thanks Giving, Black Friday, Cyber Monday, and Christmas!